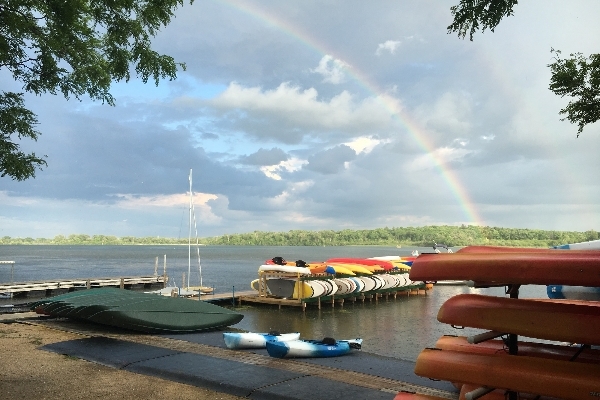 Wingra Boats has enjoyed providing the Madison community with fun, safe, and inexpensive outdoor entertainment since the 1950s. We have grown from a couple of canoes to a rental fleet of over 100 boats of all types since then. 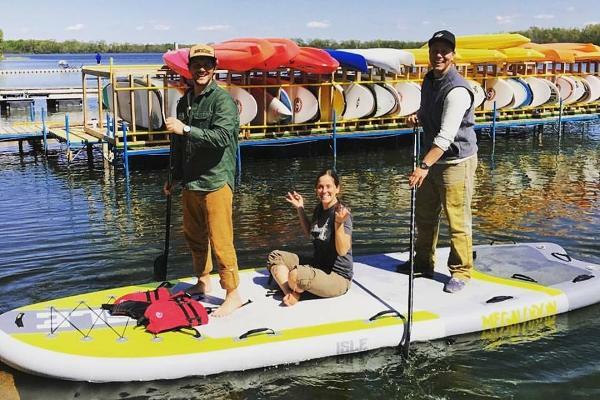 We now rent canoes, kayaks, rowboats, paddle boats, stand up paddle boards, a multi person SUP, watermat and fishing poles. 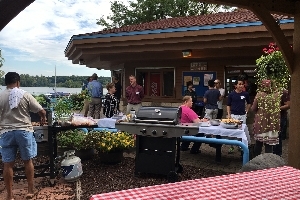 Wingra Boats provides several additional services to make accessing beautiful Lake Wingra easier - we offer memberships, private dockage, boat repair, and party & event hosting. 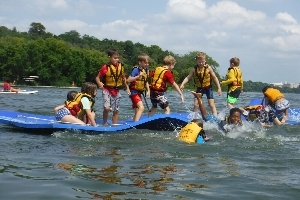 Watermat fun for up to 12 children or 6 adults! Watermat - how cool is this? 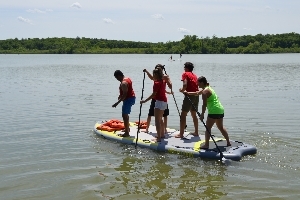 Mega SUP - 6 adults or 8 kids can paddle together! Mega SUP - our staff showing how it's done! Looking to host a party down at Wingra Boats? Reserve our gazebo picnic area which comes with a grill and propane. This space can hold up to 20 people. Reserve this HUGE SUP for two or more hours. It is a great way to get out on the water with family or friends. It can comfortably fit up to 6 adults, or 8 kids. It comes with life jackets and paddles for everyone. Reserve our watermat for two or more hours, and you won't regret it. 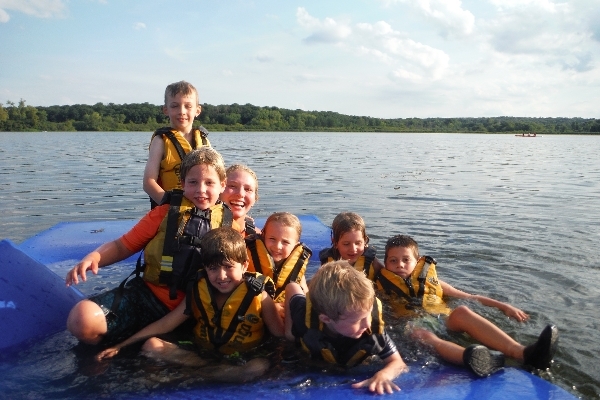 This large floating mat can hold up to 6 adults or 12 kids. The mega sup can fit up to 6 adults, or 8 kids. It is the responsibility of the renter(s) to bring the mega SUP back. If needed to be pulled back by Wingra staff, a $50 rescue fee will be charged. If paddles are lost, there is an extra fee. The grill/picnic area includes picnic tables, a grill with propane, grilling tools and the gazebo area reserved. If you plan to have more than 20 people at your event, a special reservation will need to be made. Special reservations need to be made. Please follow this link: Wingra Large Groups. Failure to make a special reservation will result in an extra fee. 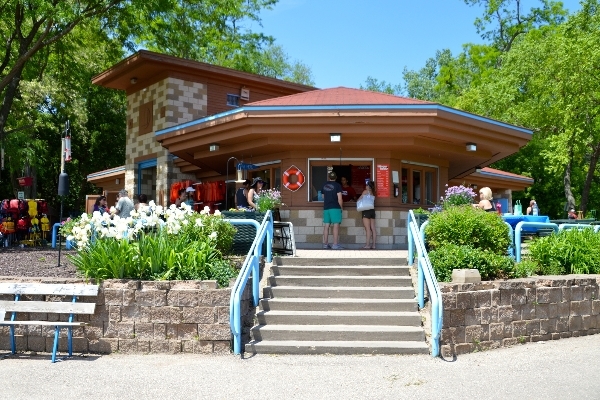 Alcohol is allowed in the park, however, no glass in the boat house/park area. Please note that if you are serving alcohol, we may have to limit your access to boat rentals. Cancellation Policy: All cancellations made 24 hours prior to the reservation will receive a full refund. Canceling within the 12 hour window of the rental will result in a 20% cancellation fee. Weather Policy: Wingra Boats staff have the ability to cancel your reservation due to weather. We will do our best to let you know ahead of time, if we plan to cancel your reservation, however, sometimes due to unforeseen weather a decision will be made at the same time as the reservation. If we cancel due to weather, then a full refund will be issued or a rain date will be selected.